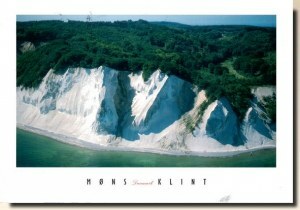 Mons Klint, impressive landmark and tourist attraction along the eastern coast of the Danish island of Mà¸n in the Baltic Sea. The bright chalk cliffs stretch some 6 km from the park of Liselund in the north to the lighthouse in the south. Some of the cliffs fall a sheer 120 m to the sea below. The area around Mà¸ns Klint consists of woodlands, pastures, ponds and steep hills, including Aborrebjerg which, with a height of 143 m, is one of the highest points in Denmark.